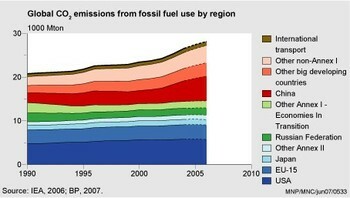 " In 2006 global CO2 emissions from fossil fuel use increased by about 2.6%, which is less than the 3.3% increase in 2005. The 2.6% increase is mainly due to a 4.5% increase in global coal consumption, of which China contributed more than two-third. China’s 2006 CO2 emissions surpassed those of the USA by 8%. This includes CO2 emissions from industrial processes (cement production). With this, China tops the list of CO2 emitting countries for the first time. In 2005, CO2 emissions of China were still 2% below those of the USA. These figures are based on a preliminary estimate by the Netherlands Environmental Assessment Agency (MNP), using recently published BP (British Petroleum) energy data and cement production data. In the 1990-2006 period global fossil-fuel related CO2 emissions increased over 35%. "